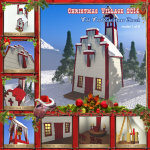 Christmas Village 2014 arrives, and this year we’ve also decided to support Blender, too! Get it for Poser/DS, MAX, Shade, Vue, Bryce and Blender. 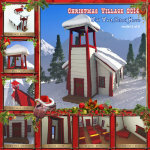 Toon Santa’s Christmas Village 2014 is a set of beautiful 3D Christmas holiday models from Meshbox Design. 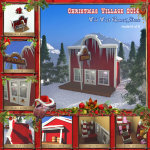 The Christmas Village series is an annual release product event that began in 2006, adding additional models to the growing North Pole village of Toon Santa. 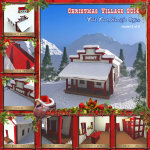 Create new, original North Pole village scenes in 3D, using 3D Studio MAX, Mirye Software Shade, e-on software Vue, Bryce, Smith Micro Poser or DAZ 3D’s Daz Studio – and this year introducing Blender! The theme for Christmas Village 2014 is Wild West Christmas. 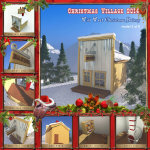 You’ll get all seven publicly released models in the series, plus the bonus 8th model only available as a part of the Christmas Village Complete Edition. PLEASE NOTE THAT INDIVIDUAL MODELS WILL APPEAR SOON. They have an organized runtime, with separate props (pp2), character based models (cr2) and separate OBJ versions of the building. Meshbox Design is the premier provider of 3D models, characters, buildings and more for Poser and DAZ Studio. This model is compatible with both Poser 7 and higher and DAZ Studio 4 or higher. Shade 3D is the powerful 3D modeling, rendering and animation software. Meshbox Design is the premier provider of 3D models, buildings and environments for e-on software’s Vue natural scenery software. This model is compatible with Vue 7 or higher. Meshbox Design is the premier provider of 3D models, characters, buildings and more for Bryce. Don’t believe us? Count how many independently created models are available from the maker of Bryce, and now many from Meshbox Design. 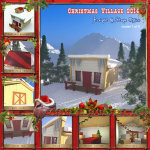 Yes, with Christmas Village 2014, there is a Blender version available.